Advance International group of companies is an internationally renowned name and is catering to the various requirements of Indian and foreign industry from more than past three decades. Our products are well known throughout the industry for their best quality, excellent performance, reliability, cost effectiveness and being user-friendly.We can design and select our other than below Dehumidifiers if your requirement is specific. Q. 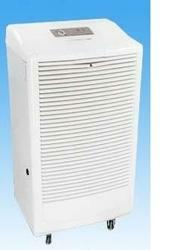 What is a Dehumidifier? A. 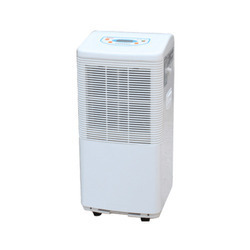 A dehumidifier is a household or an industrial appliance that reduces the level of humidity in the air, usually for health reasons of man, machine & equipments. Humid air can cause mold and mildew to grow inside homes, which has various health risks. Very high humidity levels are also unpleasant for human beings, can cause condensation and can make it hard to dry laundry or sleep. Higher humidity is also preferred by most insects, including clothes moths, fleas and cockroaches. Relative humidity in dwellings is around 50%. 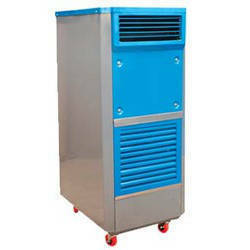 Dehumidifiers are also used in industrial climatic chambers for keeping desired humidity levels. A.Dehumidification is the process of removing excess moisture from the air in your room or covered area and is primarily accomplished through the use of a dehumidifier. Dehumidifiers work by combining three basic principles: cooling the air, adsorption, and absorption. By using coolant, dehumidifiers cool the air below the dew point which causes the moisture in the air to condense. The water is captured in a drain bucket. This same principle is also true for commercial/industrial dehumidifiers. Our dehumidifiers come equipped with larger fan motors, drain buckets, or internal condensate pumps to condense, collect and drain water away. Condensation in electric items may cause irreparable damage, and can even be dangerous. Musty smells can develop, and eventually mold, mildew and fungus will appear. These can be damaging to your health. The recommended indoor humidity level is around 50%. Dehumidifiers can help to keep your home within those levels, but there are many different types available, and lots of features to choose from. 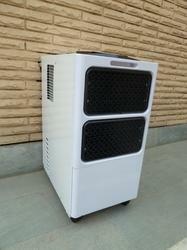 Exploring the pages of this site will help you to decide what the best dehumidifier is for your situation. Q. Where does indoor moisture in the air come from? A. Most of our everyday activities contribute to increased humidity in the home. Showering can add a 1/2 pint of water into the air. Simply preparing meals adds approximately 5 pints of water to indoor air for a family of four over course of a day. Washing your laundry, mopping, using the dishwasher and even indoor plants contribute moisture to indoor air. Our most basic activity of breathing can add 1/2 a pint of moisture to the air over four hours. In a home of 1000 square feet with constant temperature, four to six pints of water can increase relative humidity from 15% to as much as 60%. As you can see, the most basic activities have a growing impact on indoor humidity levels. In a relatively short period of time, elevated humidity levels create a suitable environment for mold and dust mites to flourish. Q. What is relative humidity? A. Relative humidity is a percentage showing how much water vapor is currently trapped in the air relative to the maximum amount of water vapor the air can hold at a given temperature. Your relative humidity level is the ratio of the current amount of water vapor in the air relative to the maximum amount of water vapor it will hold at a given temperature. Q. How do I know what size is right for me? A. There really is no easy answer to this question, and deciding which model and size is right for you will depend on several factors. You need to ask yourself several questions before purchasing. • How severe is my moisture problem? • How large is the room/location where the dehumidifier will be used? • Under what conditions will my dehumidifier typically operate? • Is energy consumption a primary concern? • Will I port the unit or empty the drain bucket? Motor, High Efficient, Power saving. to drain the water continuously. No. of persons & products inside room. Location of placement of Dehumidifier. Net Weight (apprx.) 8.85 Kgs 9.8 kgs. Gross Weight (apprx.) 9.7 kgs 10.8 kgs.